The staff at Bottle Breacher used to use .50 Caliber ammunition to defend our country down range, it is now used to provide jobs for our veterans. The .50 BMG cartridge was developed for the Browning .50 Caliber machine gun in the late 1910s, we now take these recycled/once fired rounds and make them into the best man gifts on the market! A bigger Bottle Breacher; is the round fired out of an attack helicopter or air craft. The 20mm cannon round is still used today in the armed forces. It has been around since post World War 1. The gun itself, typically referred to as the 20mm Oerlikon, became one of the most effective AAA (anti- aircraft artillery) cannons of World War 2. The weight of this bullet is a hardy piece of the action. Bottle Breacher is currently in the process of bringing authentic 20mm once fired Brass into production. Taken from the A10 Thunderbolt. It is massive! 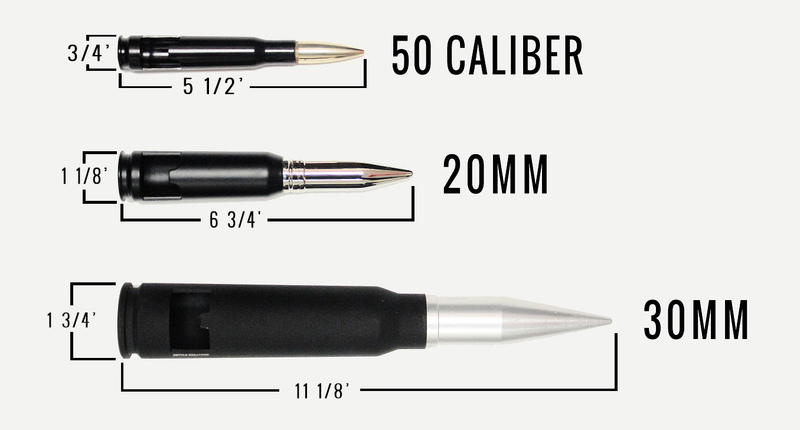 The 30mm is made with an authentic casing, with an aluminum projectile. Almost a foot long of breaching power! By far our largest Bottle Breacher to date. No beer is safe!